How to prepare your kid to have a new sibling? Are you expecting your 2nd baby? or 3rd? I am the first child of my parents. The family transformation for having a new sibling for me was not so easy. I still remember the mixed feeling of joy and complication of being an older sister. If you have younger siblings, I bet you’ve encountered the moment also! It was such exciting news hearing about my younger sister when I was 4 years old. However, I was not clearly understanding what would change and not change. That made me a little nervous. While I take pictures at a newborn photo session, I see how your older kids are reacting to the newborn and I try to give them complimenting words as being a good big brother and sister. We have variety of age groups that come for their newborn photo session from all over the place! I often meet 2-4 year olds as older siblings at my newborn photo sessions. At preschooler age, they are still very attached to their mom. Also, it is hard for them to understand sharing too. I feel that they are very sensitive to the new member compared to other ages. I was researching how I can encourage and prepare the older siblings at my session, and I found this web page with some interesting points! Dads are always very helpful! Like it says, it would be a good opportunity for them to spend quality time with dad. Most of the time, I finish up all sibling and dad photos with their newborn first. So they can play or spend time together while I capture mom and the new sibling. 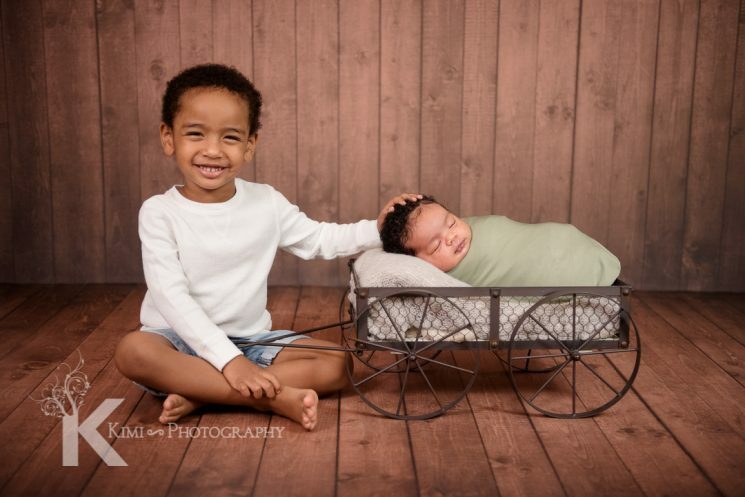 This way, the older sibling doesn’t have to wait for their little brother and sister for too long, and mom doesn’t have to be overwhelmed at our newborn photo session. Many parents want to have some siblings shots. I always like to capture those moments. The key to capture those moment with a newborn is communicating enough to the older sibling first. Encouraging them to be sweet to the newborn and earning the trust from them by not controlling their feelings. I will only be with them a short time during the photo session, but most importantly showing love to the older one during the session makes the newborn photo session more memorable for them! By seeing the pictures I capture, I hope they understand and adjust to the change and are proud of themselves being a big sibling! Please contact Kimi Photography, if you are interested in having your newborn pictures and family photography.